Welcome to Eden's Wake, a shop dedicated to bringing you stylish and quality handmade bags and accessories. All items are designed and made in my home in Little Rock, AR. Please see our Policy and Profile pages for more info. Totally cute. Exactly what it described. Sewn well, durable. Eden’s Wake began as a fun way to sell the creations of my sewing hobby, but quickly became my passion and career. I do everything in my home, and the entire process is done by me. 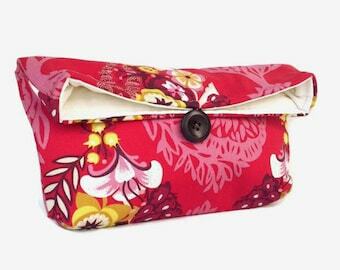 I design the bags, pick out fabrics, do the sewing, package and box orders, take pictures, and answer convos. Welcome to our store and thank you for taking the time to check it out! Eden's Wake is owned by me (Katie). I strive to make beautiful, quality products that you can enjoy for years to come. If you have any questions, feel free to contact us and we will get back to you as soon as possible. Please contact us within 3 days for a return or exchange of an item. Unless the reason for return is a mistake on our part, shipping will not be refunded and the customer will be responsible for the return shipping. Refunds would be given once item is received back in new condition. Custom and personalized orders cannot be returned (that includes special order silk clutches - please order color samples). 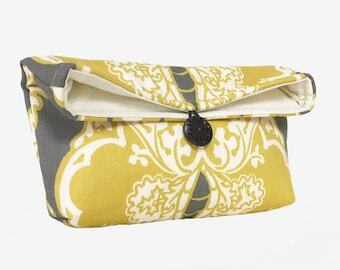 Colors will vary from monitor to monitor - if exact matches are needed on clutch sets, please order a sample. We accept credit card payments through both Paypal and Etsy. Arkansas residents will be charged sales tax. Note: When purchasing both made to order and ready to ship items with different turnaround times, all clutches ordered at the same time will ship based on the longest turnaround time. We will try to get your items shipped out as soon as possible. Check individual listings for turnaround times. US orders generally ship either USPS first class or priority mail. International orders will be shipped with either USPS First Class or Priority Mail. Note: if you are needing your order by a specific date, we cannot guarantee any international delivery speeds. Shipping speeds vary, and the shipping costs are not refundable. Expedited Shipping: If you would like us to send your item with a faster shipping option than we normally use, please convo us with your location, and we would be happy to tell you the rates available. INTERNATIONAL shoppers: you will be responsible for any customs fees, so please be aware of your country's policies. Please note, international orders can take up to 8 weeks to arrive.